After Malcolm Gladwell, author of the book Outliers, studied the lives of extremely successful people to find out how they achieved success, he wrote that it takes roughly ten thousand hours of practice to achieve mastery in a field. Pierre Le Roux, South Africa Mens Water Polo team captain is the embodiment of this theory. He started playing water polo in 1998 at age 12, was selected to represent Gauteng in 1999 for the Gauteng U14A team and has been selected ever since. 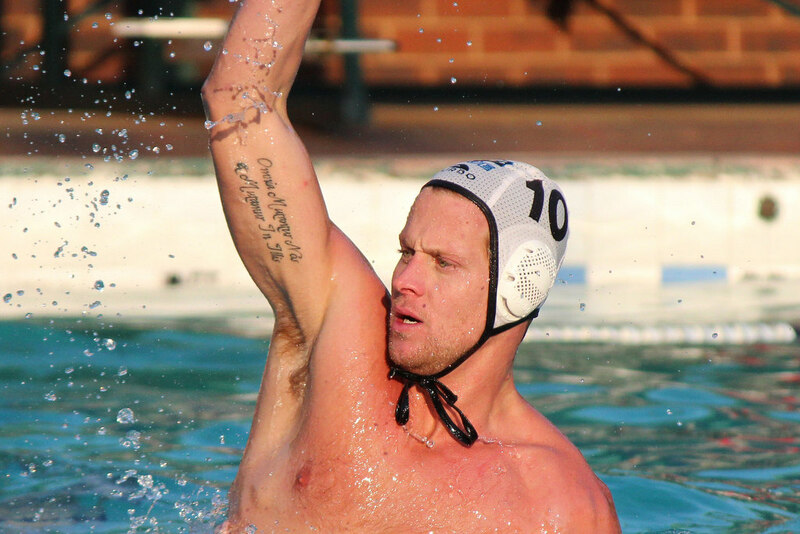 In 2001 he was selected as a member of the SA Men’s Water Polo Squad at a mere 15 years of age! In 2003, at age 17, he played his first International game vs. Denmark. Since then, he has represented South Africa 90 times, becoming South Africas most capped Springbok water polo player and the youngest player to represent South Africa. Pierre’s dedication to his sport does not end at his personal player profile. He currently coaches Water Polo at Reddam House, Constantia. He has coached school and provincial water polo for the past 12 years in Johannesburg and only recently moved down to the Western Cape. Added to this contribution to the sport, Pierre is also a qualified FINA referee and has found the time to referee at most major school tournaments, provincial tournaments and at Senior Provincial Level (SA Championships). One of Pierre’s dreams has always been to play as a professional and to be able to only focus on his Water Polo and no other Job or Studies. He realised this dream when he played for NCA Angerien in St Jean d’Angely, France during the 2008/2009 season. The SA Men’s team were not that lucky this year against Denmark, losing to the hosts of the EU Nations Cup 2015, on the opening night. This was tough on the team. However, the loss did not set them back, as they kept their focus on their goals and bounced backed in emphatic form against the Czech Republic and Ireland the following day. Pierre captained the SA Team for the first time in 2009 when they went to Montenegro for the World League Super Finals. 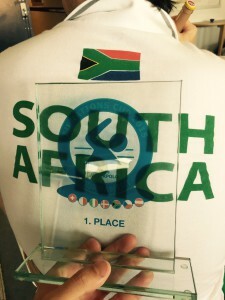 The top 8 water polo playing nations competed there and they qualified as the African Champions. This year he captained the team again, and has for the first time come home with GOLD from an international tournament. When we asked him if the training and build up to the tournament had made the difference, he had a strong response which could be taken as a message to future teams. Another positive force which cannot go unnoticed according to Le Roux, was that of the Head Coach Paul Martin, who was fantastic in his positive approach to coaching this winning team. He created an atmosphere where players could express concern and talk openly if they were unsure of what was expected from them. With this type of openness, he created a comfortable place for them all to be a part of one team with the same goals in mind. As a senior player, Pierre, had a quiet confidence in his team even though, with all these types of competitions, one can never be sure what is coming your way. Did they go in expecting to win? With their last competitive game being played in October 2014, the nerves were definitely getting to the players, who did not go into the tournament expecting to win. 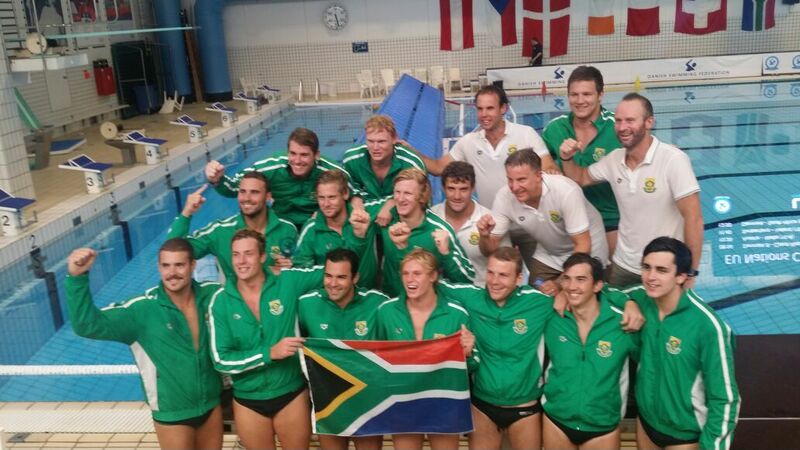 With this first win for the SA Men’s Water Polo team there is hope that the publicity and coverage of this success will raise the awareness of the sport within South Africa. Notoriously known as one of the toughest team sports, but undoubtedly one of the fastest growing sports today, South African water polo has shown itself. This sport that takes the speed of hockey, the focus of soccer, the strength of boxing, insane amounts of agility, all while treading water is on the rise so visibility of water polo on the sporting stage must increase. The sport is desperate for some corporate sponsorship, to help fund and guide our teams to more success. 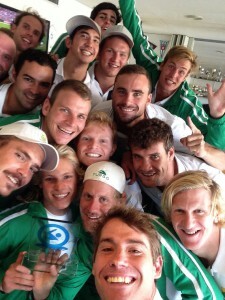 This week, our South African Mens water polo team returned with the Gold medal from the EU Nations Cup. These men are our heroes who have dedicate years to being in the condition to compete on the international stage.